Probably the most confused/confusing brewery in Denmark. What I mean with that is they never seem to be consistent with the naming of their brews across their range. Forever changing brew names, labels, having organic and normal versions of the same brew, calling one beer something in a 33cl bottle and a different name in a 50cl bottle.. and so on. For gods sake, simplify the bloody range please ! Whoever is in charge of product management needs a good kick up the arse. Enough said. As the name might suggest, a whole lot of malt with some chocolate and dark fruit coming off this from the pour. Malthe pours dark brown with a ruby tinge in the glass along with a light beige creamy head. A medium sweet malty intake with dates, dark sugar, prunes(eeek) and licorice, thankfully well in the background while the finish is slightly dry. There is no hop/bitterness to this at all. The mouthfeel is light and bordering on oily. I have to admit I'm writing this on the second bottle of this I tried, the first I drank quick straight from the fridge a couple of days ago and initial thoughts were it was not bad. This time however I've taken more time and the beer has went through the temperature changes while I pondered what an original IPA actually tasted like(last blog post), thanks to someone who gave me a good couple of suggestions btw. For anyone that reads this blog regularly you will have noticed I hate two things in beer, well one is okay if it is in a stout...Prunes and licorice, the latter is the okay one. I ####ing detest prunes and the taste became more apparent as the beer warmed up. Of course, that is what I taste, your own mileage may vary. Not impressed with this at all.. unless drunk at 4c quickly. 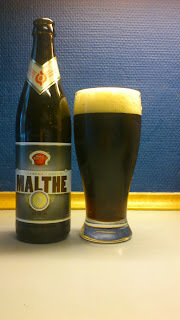 Not one that will pass my lips again as there is far better dark lagers available in any larger supermarket. Yet another organic let down. Where to buy/avoid CPH : Any larger supermarket.